In Phillip Keller’s book, A Shepherd Looks at Psalm 23, there is a good description of the kind of beast the sheep really is. 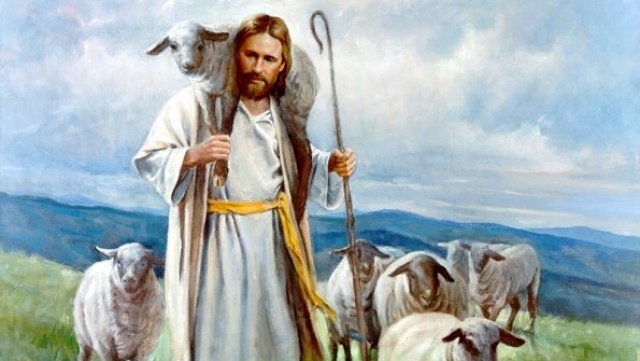 Looking at the verse, “In green pastures he makes me lie down,” he relates what it takes to get sheep to lie down. “Because of the social behavior within a flock, sheep will not lie down unless they are [at ease] with others of their kind. If tormented by flies or parasites, sheep will not lie down. Only when free of these pests can they relax. Lastly, sheep will not lie down as long as they feel in need of finding food. They must be free from hunger.” To have a contented flock, a good shepherd had to be aware of and attend to the needs of his flock. What does this mean for us in our day to day lives? It means we need to overcome our Ego. We need to stop being offended; to let go of the need to win; to let go of the need to be right; to let go of the need to be superior; to let go of the need to have more; to let go of identifying our self by our achievements; to let go of our reputation. Consider this, when we surrender all these things to the Father as Jesus did we will know true peace in our life. whom he has sent for our hope and strength. and enjoy the light of his presence forever. “Be imitators of me, as I am of Christ.” Paul speaks those words to move the Corinthians to reform their lives as followers of Christ. In a meme I saw on Facebook recently I read: We aren’t called to be like other Christians; we are called to be like Christ. That is the challenge because to follow Christ always means to step beyond the bounds of convention. If it were not so Jesus would never have been condemned to die on the cross. In the first reading from Leviticus we see what the convention was. "If someone has on his skin a scab or pustule or blotch which appears to be the sore of leprosy, the priest shall declare him unclean by reason of the sore on his head. 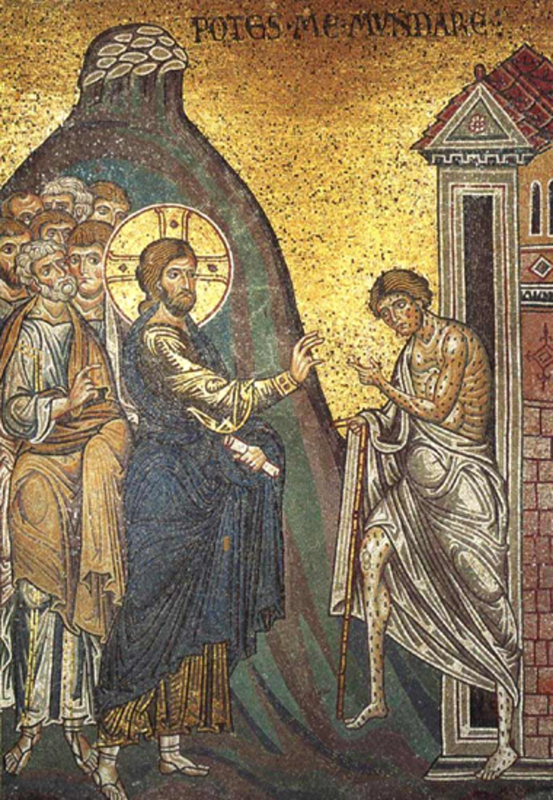 The one who bears the sore of leprosy shall cry out, 'Unclean, unclean!' [and]…He shall dwell apart, making his abode outside the camp." What the Hebrews of the time of Moses knew about leprosy is not certain, but what contagious skin diseases could do was potentially deadly to a band of nomads. These restrictions carried far beyond the wandering in the desert up to the time of Jesus. In the gospel, we hear that a leper came to Jesus and kneeling down begged him and said, "If you wish, you can make me clean." In approaching Jesus in the manner he does, the man is committing a terrible social blunder and he may be breaking the law too! In the face of all this, Jesus is not repulsed or shocked; he is “moved with pity.” Just three words, but they tell us so much. Jesus’ remarkable answer: “I do want to.” In an extraordinary move, Jesus stretches out his hand and touches the man. As noted, the ancients thought that leprosy was communicable, and at the very least disgusting. But Jesus touched him with care and said, “Be made clean.” Our spiritual life consists of being “made clean,” no matter how disgusting our failings may be. We must receive Jesus’ touch, especially his touch upon our souls (Foley). The law made lepers outcasts; but, even without the law, nobody wanted to touch a leper. The leper healed by Jesus must have lived for a long time without the touch of another human being. Who are the lepers, the outcasts in our society today? Who do we know who needs a healing touch, or to be brought into society, out of its margins? In the Eucharist, before we receive the Body of Christ we say, “O, Lord, I am not worthy that you should come under my roof , but only say the word, and my soul shall be healed.” Then, with the touch of Christ, we too are healed. When we leave the liturgy we are meant to take Christ’s healing touch out into the world that we live in, making it one with Christ. What is wisdom? What does it mean to be truly wise? These are the questions put before believers in today’s scripture selections. In an attempt to find a fresh approach and to put a new face on this timeless but ever timely topic, a scripture scholar Patricia Datchuk Sanchez decided to consult “the mouths of babes”. If we consider the parable in this light we see that Christ is the Bridegroom whose coming is delayed, the five wise maidens are those Christians who have remained steadfast and prepared, and the five foolish maidens are those Christians who have wavered in their commitment. We can see then why the wise maidens couldn’t give oil to the foolish maidens because the “oil” is the wisdom of God that must be sought for oneself. “Therefore, stay awake, for you know neither the day nor the hour." One of the popular symbols of this season is the Christmas tree. There are some who already have one standing in a prominent place at home. The year Louise and I became engaged one of the first things we did was to buy a piece of property near Oak Openings, and one of the first things we did on that property was to plant a row of Colorado Blue Spruce along the right of way of the road. Tiny seedlings we planted. We tended them; brought water from town to keep them safe from the hot dry weather of the following summer. After we built our house and moved in with our family we watched them grow a little taller each year careful not to mow them down until they were large enough to escape that fate. Fir trees seem to take a long time to grow until at some point they seem to grow by leaps and bounds. We didn’t realize it, but the trees were now at a more vulnerable stage, they were at the height and shape where they made perfect Christmas trees. When I left for work one dark frosty morning I didn’t notice the damage that had been done in the night, but as I returned home later in the light of day I was shocked and angry at what I saw. Two of the trees had been cut with only the bottom tier of branches remaining. We had planted these trees to grace the land for years to come, and someone saw fit to cut them for a few days’ pleasure. We related this to a friend of ours who had a Christmas tree farm and he told us to leave the remaining branches. He said the branches will begin to grow upward. Amazingly they did, and in a few years you couldn’t tell what had happened. In a few short years we had seen a cycle of planting, tending, growth, destruction, hope and regrowth. In scripture, the olive tree is often used as a symbol of Israel. In the first reading we read of a stump of a tree from which a shoot is growing. In particular this stump refers to the fallen line of the kings of Israel and the shoot is the heir of David, the Messiah, the Christ. Isaiah is encouraging the returning exiles to take hope in the Messiah-king who will have all the favor of God and whose reign will be one of justice and peace. 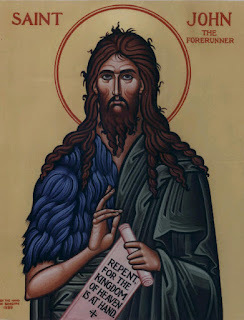 In the Gospel, John is crying out, “Repent for the kingdom of heaven is at hand,” fulfilling Isaiah’s prophecy of “one crying out in the desert.” People are flocking to John for his baptism of repentance. They are anticipating the coming of the Messiah foretold by Isaiah. “As herald of Jesus and the reign of God, John the Baptizer explained by word and example precisely how to prepare a welcome for Jesus. Those who came to hear him speak, in the Judean desert near the Jordan, were told, “[Repent]!” (vs. 2). Reform or repentance indicates that welcoming the reign of God requires a complete conversion. In Hebrew, the word for conversion, shubh, implies that a person has found himself/herself on a wrong path or going in a wrong direction and has made a complete about-face or turnaround in order to return to God. In Greek, the term for conversion is metanoia, which means an absolute change of mind and will.” (Sanchez). John’s message was about justice, about social change. He challenged the people of Israel to get down to the root causes of problems, to uproot unfruitful trees. The changes that are called for in Advent are fundamental and far-reaching; they are structural. In this new church year, we are challenged to work for a better society, different from the one we now have. The Christian message relies on the conversion of people which will in turn bring about these changes in society (Medellin Documents). How do we repent? How do we prepare the way of the Lord? We do this when we feed the hungry, clothe the naked, forgive the guilty, welcome the stranger and the unwanted child, care for the ill, and love our enemies. In the Lord’s Prayer we pray “thy kingdom come.” Then the presider says the prayer which ends “as we wait in joyful hope for the coming of our Savior, Jesus Christ.” We then receive the Body and Blood of Christ. Jesus comes to us in the Blessed Sacrament, but it does not the end here for we must go and announce the gospel of the Lord and glorify him with our life. Heavenly Father, fill our hearts with your love so we can help make your kingdom come.